NCAA autonomy: Giving more power to the five richest conferences will be better for college sports. But giving more power to the five richest conferences in college sports will be better for the players anyway. 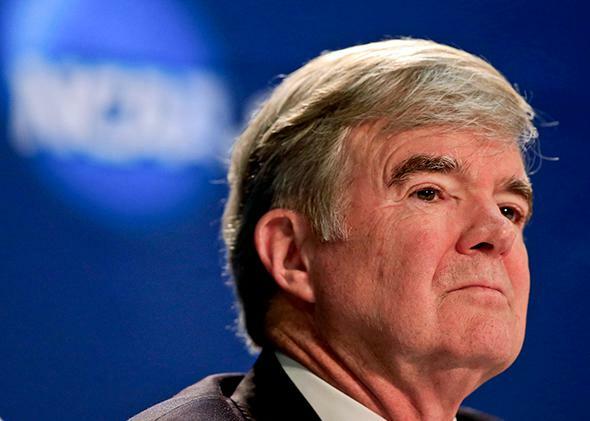 NCAA President Mark Emmert speaks to the media on April 6, 2014, in Arlington, Texas. College sports are not fair. They never have been, and they never will be. It’s a wonder, then, that so many people seem so dismayed by Thursday’s vote by the NCAA Board of Directors, which gave the 65 schools in the five richest conferences broad latitude to make the rules that govern intercollegiate athletics. New rules mean looser purse strings: If these changes are ratified by the other Division I schools, then the Power 65 could vote to pony up for policies to insure athletes’ draft stock (as some schools already do in certain circumstances), to guarantee four-year scholarships, and to spend more lavishly on recruiting, among many other things. Though every Division I athletics program would be allowed to do the exact same things, Alabama will be making rules that the University of Alabama at Birmingham likely can’t afford to follow. “How is it fair that the richest conferences would be allowed to set and play by their own rules, widening the already yawning gap in college sports between the haves and have-nots?” asks the New York Times’ Juliet Macur. It’s not fair—not at all. This supposed shift in how big-time college sports operate, though, is really just an acknowledgment of the status quo. There were haves and have-nots yesterday, there are haves and have-nots today, and there will be haves and have-nots tomorrow. But not all injustices are equal: Ball State’s inability to compete with Florida State on the football field isn’t all that upsetting, especially when compared to the systematic exploitation of college athletes. That’s why this week’s changes are worth celebrating: By enshrining one kind of inequality, the NCAA has taken a small step toward addressing the unfairness that really matters. What’s not worth celebrating is the unctuousness with which college sports’ money men announced the NCAA’s new path. “We will begin to focus on student-athlete welfare in ways they will feel as early as next year,” said Ohio State President Michael Drake, describing what will change now that higher education’s sports superpowers have taken the controls. This newly entrenched elitism “will allow us to focus more intently on the well-being of our student-athletes,” said Wake Forest President Nathan Hatch. To hear these fellows tell it, they’d long been held back from lavishing student-athletes with the kindness they deserve. If it weren’t for the takers (all those small schools that the big boys have been propping up) and rule-makers (the unfeeling, pious NCAA), student-athletes would have had, say, guaranteed four-year scholarships a long time ago. By breaking off from college sports’ minnows, the Power 65—every school in the ACC, Big 12, Big Ten, SEC, and Pac-12, plus Notre Dame—is buying time and goodwill. For now, the benefits they’re offering will likely come in the form of cost-of-attendance stipends, payments in the low thousands of dollars that would make up for any shortfalls that a scholarship doesn’t cover. There’s also talk that they’ll push through guaranteed four-year scholarships in lieu of the year-to-year renewable grants-in-aid that have long been the NCAA standard. Coaches and athletic departments can yank these year-to-year scholarships for any reason: a bad attitude, an injury, poor performance. Four-year scholarships, then, will give college athletes a measure of protection that they have too often lacked. Don’t fall for the college presidents’ talking points: This is about competition, not compassion. In 2012, 205 of 330 Division I schools—Alabama, LSU, Texas, and USC among them—voted against a provision that would have merely given universities the option to offer four-year scholarships. Now that four-year scholarships are permissible, everyone’s suddenly on board, with USC athletic director Pat Haden saying that the school will give out guaranteed four-year deals to “lead the effort to refocus on student-athlete welfare.” Given that USC voted against guaranteed scholarships just two years ago, it seems unlikely that Haden is really motivated by student-athlete welfare. Rather, he doesn’t want to be at a competitive disadvantage—if Oregon can offer a four-year scholarship, then by golly USC’s going to offer the same thing to its recruits. This, ultimately, is why the Power 65 will be good for college sports. The NCAA’s biggest spenders won’t do right by college athletes because they’re soft-hearted. The only reason they’ll offer up guaranteed scholarships or cost-of-attendance stipends is because they think a judge will force them to do it, or that they’ll lose every top recruit to another big school if they’re not giving their football players the exact same perks. The NCAA’s new structure won’t help Utah State compete for a national championship, but that wasn’t happening anyway. It might even make it harder for a basketball team like Butler to make it to the national title game. It’s unfair, too, that athletes at smaller schools might not get some of the perks that their big-school brethren start to receive. And it’s also worrisome to think that these half-measures—which amount to a slightly better status quo—could make the NCAA’s fundamentally irredeemable system of unpaid labor more difficult to challenge in court. But for now at least, this is the best change that we could hope for. Bowlsby, the Big 12 commissioner, was right when he said that the message of Thursday’s vote was “that our student-athletes and our programs are largely the face of what America knows as college athletics.” The Power 65 schools, and the athletes who play there, are the reason why college sports are a money-printing enterprise. This NCAA restructuring will, in a couple of small but important ways, help redirect some of that money to where it belongs.